I never had a bicycle with training wheels. I bought my first bike off of another kid in the neighborhood for $2. I taught myself how to ride it by pushing it up to the top of a hill coasting back down. That got me to figure out how the whole balance thing worked. Then I just had to figure out how the pedals worked. They look like they fell off. That is not a hula-off at all. My first bike was named ZipZap, Jr. There was no ZipZap, Sr. I just thought it was a cool name for a bike. Biff looks to have been riding that chair kinda hard… It looks battered. My big sister taught me to ride a bike – on ice covered roads, in the middle of a Colorado winter. Training wheels? Hah! 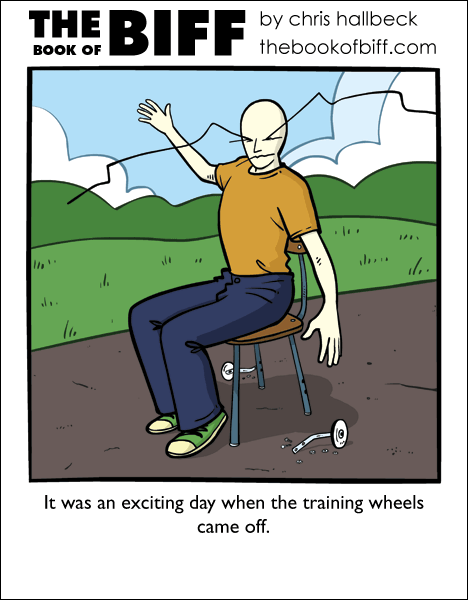 I laugh at training wheels! i always wondered does biff has an insurance or is he blacklisted every where ? But he might not need it, as he always recovers. You would’ve made me a happier night-owl by saying Crom laughs at them, instead of yourself. But, this begs the question…are *you* Crom? I mean, this is the internet. It’s where gods dwell. Considering Biff’s propensity to disastrous accident, I totally understand why he’d have training wheels on a *chair. * I mean, he runs risks we mortals and our mundane capability for mishaps, cannot even fathom. Or maybe he’s representing the whole of humanity…and our (in my opinion) unlimited potential for trouble, accidents, pitfalls and so on. I HAVE to say this, even if I risk banning…has anyone ever considered what Biff represents, in relation to pop culture characters? Who he can be likened to? If I wanna be classic, and kinda far-fetched (yet respectfully honoring), I’d say he’s got a tenuous link to Wile E. Coyote. Now, someone that actually rings closer, in regards to his bald, accident-prone (yet always surviving) status…is actually Homer J. Simpson. And this doesn’t sound respectul of poor Biff Hugh Brows at all (apologies for pun and for enforcing a second and last name for The Biff without authorisation from The Chris). Way too commercial and mainstream. And they have jumped an entire reef’s worth of sharks, too. While Biff is more artistic, bizarre, and conceptually pure with a touch of retro. Or maybe, I mean…”conceptually” sounds like a big word small people use to look smart. Just randomly half-lucid thoughts for the night. I used to have this Awesome Big wheel tricycle, it was a Cobra, and I lived on a rather steep hill. so of course I nearly got hit by cars several times and probably was going the actual road speed limit down the sidewalk… when I was 7 my friend (also 7) actually pulled a knife on me and stole my Cobra… his mother made him give it back, but our friendship never recovered. Also, I thought at first the training wheels came off Biff’s legs. @Sleeping Orange: What are you talking about? i just realized biff is on a three legged chair. What happened to his invisible green chair? @Izual Shima: YOU ARE NOW BANNED FROM THE FORUMS!!!!!!!!!!!!!!!!!! @Micah: On the forums, Chris posts small segments of his drawings as “sneak peeks” of the comic; in one of them, (the one for this comic) all he showed was Biff’s head and right arm. Whenever Chris posts a sneak peek, we all jokingly try to guess what the comic’s about; for this one, I said, “Biff enters the hula-off only to realize that in a world empty of other people, there are no judges. For each of the following sneak peeks for this week, I made jokes about a hula-off, such as “Biff spies on his biggest competitor, Biff, at the hula-off.”, and “Biff was depressed when he found out Biff beat him at the hula-off.”. My post here in the comments was just a small in-joke. You know, I didn’t learn how to bike until a few years back when I was around fourteen. I was, for some reason, too scared when I was little, and I just never learned. One day I had a dream where I just picked up a random bike and started biking, and for some weird reason, I felt as if I knew how to bike. After a while, I actually did pick up a bike, and HUZZA. I’m not kidding btw, although my skills weren’t excellent, I knew, but now I love biking. Ah, okay. That makes sense now. Thanks. Back in Minnesota, we lived a short distance from a hill that led down to a park…I would take my bike there (even if walking was easy), then coast down the narrow path at high speeds (steep hill). Then when I went back home, I’d move at about 1 IPM (inch per minute) biking back up. Sledding down that hill was more fun though, even if it’s even slower going back up through deep snow dragging a sled behind you. Moments after my dad took my training wheels off my bike I took it out into the gravel driveway and promptly crashed splitting my head open. Just so everyone knows, Training wheels are not the best way to learn to ride. It’s too easy for a kid to go too fast, turn, and topple over, and adults won’t go near them. When I tried to teach my 20-year-old friend, I took the pedals off a Walmart bike, and encouraged him to sit on it and use his feet for a while. That’s the same way I finally learned to ride a bike. About 1/2 mile away from where we lived there was a subdivision on a hill, with a twisty road up through it. I pushed my bike to the top, got on the seat and coasted down *without trying to pedal*. One trip is all it took for me to learn the trick of balancing and steering. Adding pedaling to balance was easy. The difficult part is trying to learn balance, steering AND pedaling all at the same time. It’s like trying to learn to fly a helicopter where one must simultaneously master throttle, collective pitch, cyclic pitch and the tail rotor (rudder) pedals all at once. There’s some guy in Argentina who never graduated high school yet invented his own helicopter and has a company building them. He also invented a training device that holds one of his copters and can restrict it to any combination of manuvers so a student can learn each control on its own without interference from all the others. Then each can be combined with one other so the student may learn (for example) how the cyclic pitch interacts with the throttle. He claims he can have a pilot ready to safely solo a chopper in 1/2 the time of standard free-flight instruction. XDD I love that. Biff looks happy!